Manila: Rice prices, which have nearly halved from record levels earlier this year, could easily spike again as the global economic downturn increases consumption, an industry expert said on Thursday. Layoffs and poor incomes will increase demand for rice because people who have less money to spend will turn to less expensive foods such as rice, a staple for nearly half of the world’s 6.6 billion population, said Robert Zeigler, director general of the International Rice Research Institute (Irri). Benchmark Thai rice fell below $600 a tonne this week for the first time in seven months amid thin demand as buyers haggled for lower prices in the belief they would come down further. The price nearly tripled to a record $1,080 a tonne in April as big producers such as Vietnam and India curbed exports to secure domestic supply. Even at current levels, rice prices are still about double the $300 a tonne seen in 2007 and Zeigler said it was unlikely prices would fall below that. “I don’t think we will ever see prices down at $200 a tonne again; those days are gone forever. I don’t want to be predicting another big run-up in rice prices but the market is very thin and it’s very sensitive to any shocks so we have to be vigilant," he said. Nor does it help that the major rice producers impose export curbs, which only “exacerbate the situation and cause panic", said Zeigler. Irri, based in the Philippines, expects global rice consumption in 2009 to be around 426 million tonnes (mt), an increase of around 1% from the previous year. Global production of the grain is projected to reach a new all-time high of 432mt in 2009, also up about 1% over this year’s record 428mt. Zeigler said the ongoing credit crisis would also make it difficult for governments to invest in agricultural infrastructure, which is key to boosting long-term production. “We saw those investments were curtailed after the 1997 (Asian) financial crash, so I think there’s reason to be concerned about that." 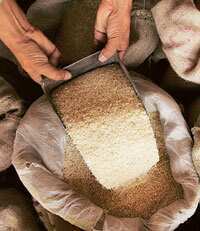 With the world consuming more rice each year than it can produce, prices have been rising steadily since 2000, he said. Last week, South-East Asian nations supported an Irri-proposed action plan meant to boost yields and encourage use of new technology among farmers in the region to increase production.